To athletes it’s an absurd question, but to beginners or returners this question is essential: “How do I start my fitness program?”. With these helpful tips and rules from the moveguard expert Sara Thys, it will be easy for you to re-start your training routine. Sarah Thys:From my experience as moveguard trainer I recommend integrating the family and working environment if you want to change your fitness program successfully. Don’t set your goals to high! 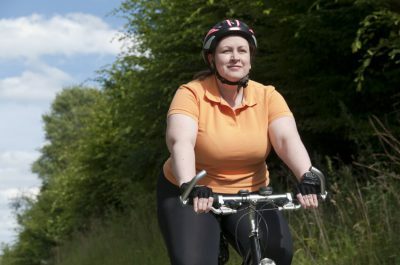 If you need/shall/want to lose weight, you should start with doing sports. In doing so, you will usually be very successful very quickly. As soon as your fitness program has become a routine, you can start changing your diet. moveguard:Within the last years you have trained with a lot of beginners in sports. What are the biggest mistakes you have seen? Sarah Thys:Actually, it’s always the same problem. People start very euphorically and overestimate their strengths. They try to train too fast, too intensive, and too long. People who haven’t done their workout for 12 months can’t expect to tie on their former performance. For this reason, you should start with a lower intensity so that the body is able to adapt to the physical exertion. moveguard:What is meant by intensity in sports science? Sarah Thys:If you re-start your training routine, the body needs to adjust to the physical exertion slowly. This applies to the cardio-vascular system and respiratory system as well as to the bones, the muscles and tendons. Even if you did get sufficient air during the training, you should keep in mind that your knees and feet also need to adapt to the physical exertion. moveguard:How do I know whether I train in my optimal intensity zone? Sarah Thys:That’s a tough question. 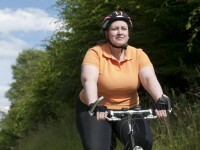 You should feel that you’re exercising – a discussion while training shouldn’t be possible anymore. First of all, a subjective self-assessment is very important. You should ask yourself the following questions: “Do I still get sufficient air? Do my muscles ache? Do I move loosely?”. 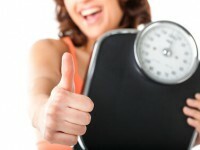 However, the longer you didn’t do sports, the more difficult it will be to do a self-assessment. That’s why you should increase the intensity slowly. If you are still uncertain concerning your optimal intensity zone, you can use objective parameters, e.g. a heart rate monitor. The heart is the muscle that reflects the objective physical exertion the fastest. moveguard:How can I set up my own fitness plan? When can I get faster? Sarah Thys:Healthy people who haven’t done sports for a long time, should do their 30-min-workout two to three times a week. It’s better to train more often with shorter training sessions, instead of doing long workouts just at the weekends. This often leads to aching muscles or tendonitis – so, this is not ideal for a perpetual sports career. Before increasing the speed (e.g. 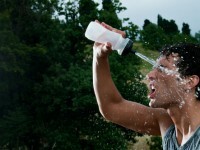 in running intervals), the duration should be extended every two to three weeks. If you start with 30 minutes and manage to sustain the physical exertion easily, you can extend the duration of the training sessions by 10 minutes until you reach a maximum of 60 minutes. Only then do you increase the intensity. Now you may include interval training into your training plan by switching between slow running and walking. To let the body adjust to the physical exertion, I recommend beginning with a training session consisting of 1/3 running and 2/3 walking (e.g. 6 minutes walking and 2 minutes running). At the beginning the duration should be 30 to 40 minutes and can be extended in the course of time. moveguard:We have been talking a lot about running and walking. What do people need to consider concerning runners? Sarah Thys:First, you should spend your money on very good runners. Second, take your time and get competent advice in specialist shops. Third, the shoe has to fit your needs (e.g. 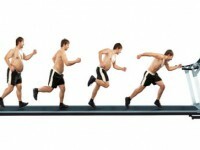 body weight, running surface) and your feet. There are some shops which offer testing the shoee at home during your training. If you are not happy with your choice, you may return them and chose another pair. Time and money are well invested! Dipl. sports scientist Sarah Thys is research assistant at the German Sports University Cologne and former moveguard trainer. She is expert in the field of training science and has helped many people to lose weight by offering them optimal training plans.